On November 21st, 2004, the government-approved, would-be presidential successor Viktor Yanukovych and opposition party leader Viktor Yushchenko ran neck-and-neck in the Ukrainian presidential election, the former’s ultimate victory the result of electoral fraud, voter intimidation, and general corruption. 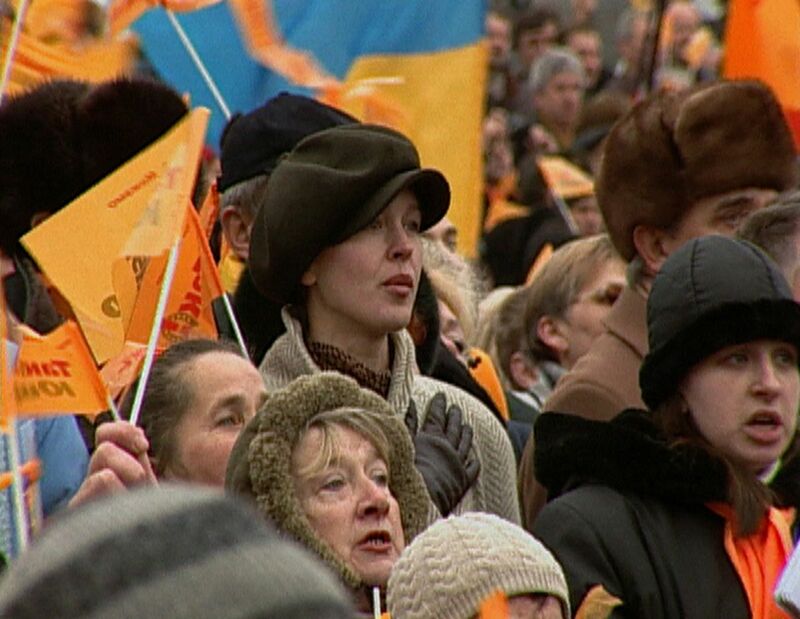 Over the next five days, hundreds of thousands of disgruntled supporters of the opposition party—eventually known as the Orange Revolution (blue being the color of the unfair victors)—took to the streets of Kiev, utilizing their power for action and physical presence in lieu of their failed right to the vote. Sit-ins and protest marches continued day and night despite the ceaselessly falling snow, students abandoned their studies with a blessing of approval from their professors, and entire portions of the country ceased working—even government-controlled media employees subverted their rulers, such as a news station’s sign language interpreter who imparted to the deaf that lies where overtaking the airwaves. Finally, on November 26th, the Ukrainian Supreme Court declared the election a fraud; Yanukovych ultimately won the revote by a significant margin. Andrei Zagdansky captures this historic moment of democracy in action with a cool patience that exemplifies its subjects’ united willpower and spiritual connection to their homeland; truly, they are a politically aware and empowered populace mad as hell and not going to take it anymore. One can’t help but think about it in comparison to most American’s meek acceptance of the contrived 2000 election results, but this is a story that remains truly that of the Ukraine’s, with Zagdansky’s attempts to chart it amid artistic representations of the countries’ history proving to be a somewhat double-edged sword. Dovzhenko’s silent masterpiece Earth is invoked as a classic example of Ukrainian revolution, though the connection made between its mesmerizing evocation of socialistic equality and the Orange Revolution’s exercise in democracy never seems to extend beyond the fact that both featured large and mobilized groups of people taking back what was rightfully theirs. Nonetheless, even while the film’s deliberate narration occasionally feels at stylistic odds with its socially visceral imagery, this artistic juxtaposition lends its portrayed events an appropriately mythic tinge. In the era of V for Vendetta‘s shallow government paranoia, this is a necessarily refreshing look at the dynamics of revolution.